Sundance Multiprocessor Technology unveiled the new SMT6657, the high performance PC/104 embedded processing module of small form factor of 90mm x 96mm. SMT6657 is sleected by the new Facility for Antiproton and Ion Research (FAIR) currently being constructed in Darmstadt, Germany to power its SIS100 Proton Accelerator. The SMT6657 features two on-board, dual-core TMS320C6657 floating-point DSPs from Texas Instruments based on the TI Keystone multicore architecture. It clocks at 1.25GHz and generates a raw floating-point performance of 40 GFLOPS (20 GFLOPS per core). The DSPs are closely coupled to an on-board Xilinx Kintex Ultrascale KU35 FPGA used for filtering and post-processing and which also provides the I/O brain of the board, controlling a PC/104 interface, the new PCIe/104 OneBank for high-speed connection to a growing range of compatible boards from the ecosystem. The SMT6657 also has a VITA 57.1 FMC module enabling high-speed ADC/DACs, vision interfaces, sensors, and fibre interfaces, etc to be easily added. Using the dual-lanes of the SerialRapid I/O interfaces found on the DSP and the FPGA as a switch on the PC/104 OneBank connector, it is possible to interface an infinite number of SMT6657 boards together in a system to create a truly embedded stackable supercomputer. 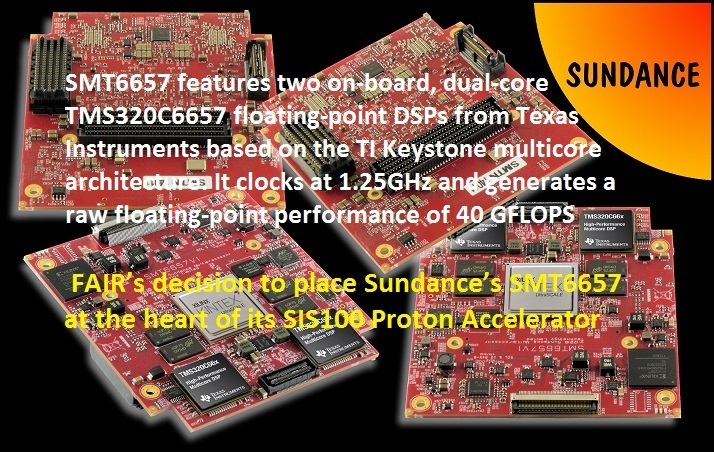 Sundace says "the SMT6657 complements and supersedes Sundance’s original PC/104 board with combined on-board DSP and FPGA processors, the SMT374, which was developed in 2007 and will continue to be manufactured by Sundance as part of its obsolescence protection programme for customers. However, the SMT6657 provides 40 times the performance in the same footprint as the SMT374, takes less power and sells at a lower cost. Importantly, it also provides code compatibility due to TI’s Keystone instruction set." Code compatibility with older DSP control systems, high performance, low latency and its stackability were all critical factors in FAIR’s decision to place Sundance’s SMT6657 at the heart of its SIS100 Proton Accelerator for its international, state-of-the-art, multi-purpose accelerator facility. The FAIR facility will use antiprotons and ions to perform research in the fields of nuclear, hadron and particle physics, atomic and anti-matter physics, high density plasma physics, and applications in condensed matter physics, biology and the bio-medical sciences. The project is being realised by partners from Finland, France, Germany, India, Poland, Romania, Russia, Slovenia, Sweden and the United Kingdom and has roughly 3,000 scientists from more than 50 countries already working on the planning of experiments and the development of the accelerator facilities.